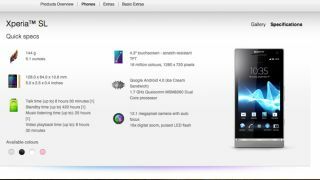 Sony has launched the successor to the Sony Xperia S handset, but it isn't really an update worth shouting too loudly about. Perhaps that's why the Sony Xperia SL handset just appeared on the company's website with very little fanfare and a simple 'coming soon' tag. The device, as reported early this month, features a slightly-faster 1.7GHz dual-core processor and Android Ice Cream Sandwich right out of the box. The current model has a 1.5GHz dual-core chip and arrived with Gingerbread in tow. Beyond that, it features the same 4.3-inch, 720p touchscreen, same design and the same 12.1-megapixel camera. You'll also be able to pick it up in silver and pink, as well as the black and white shades, when the SL goes on sale. No word yet on exactly when that will be.